I know you read the title of this post and COULDN’T EVEN. Broccoli cheeze goodness, in burger form. Minus the cheese. Who needs cheese when there’s cheeze? Who’s confused? Everyone raise your hand. You see, “cheeze” refers to the pungent, cheese-a-licious flavor of nutritional yeast. While lotsa you know all about nutritional yeast (AKA “nooch”), lotsa you don’t. So let’s chat. Nutritional yeast is a deactivated yellow yeast that’s super common in the veg community not only because it lends that familiar cheesy taste, but also because it’s packed with hard-to-come-by B vitamins and plant-powdered protein. Vitamin B12 is critical for the health of your nervous system. It’s so critical in fact that a deficiency can cause irreversible nerve damage. The interesting part is that this vitamin is only found in animal products. Why, you ask? Because little microorganisms in the water and soil produce vitamin B12, meaning all the animals that drink and digest those organisms from the earth become chock full of the vitamin. We then eat those animals and ingest the B12. For those of us who don’t eat many animal products, we lack B12 since those organisms get washed off the plants we eat. Moral of the story, B12 is really found in the soil! While we’re on the supplements topic, be sure to go for methylcobalamin if you’re purchasing B12, which is the form that’s best absorbed by your bod. When purchasing nooch, be careful to read the label since not all brands are fortified with B12. I like the Bragg’s brand. You can find it at Kroger, Whole Foods, etc. Now I want your guys’ honest opinion. Do ingredients like oat flour and nutritional yeast and ground flaxseed freak you out? Do you see them in a recipe and turn away? I want this space to be un-complicated and I’d love to know if you’d appreciate a post explaining ingedients you may or may not be familiar with. I’m all ears. Note the comment section below! Now go have your cheeze and eat it, too. 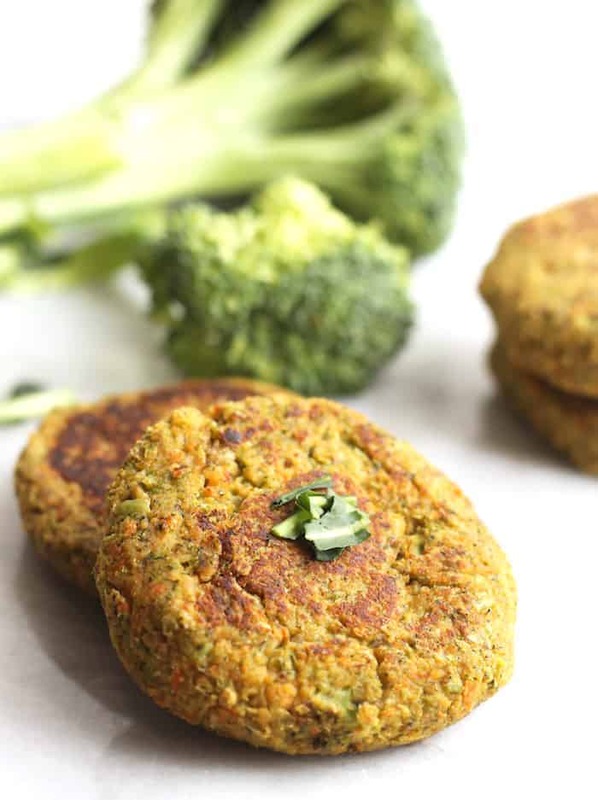 A deliciously heart vegan burger packed with broccoli cheeze flavor! Heat oil in a skillet over medium heat. Once hot, add onion and sautee for 7 minutes. Add broccoli and garlic and sautee for another 5 minutes. Set aside. Add carrot to the bowl of a food processor. Pulse until finely chopped. Add in cooked veggie mixture, chickpeas, oat flour, bread crumbs, nutritional yeast, flax or eggs, salt, and pepper. Pulse until well-combined, but not mushy. It should still have texture. Form into four tightly packed patties. It may help to wet your hands. Place patties on a plate lined with parchment paper and refrigerate for at least 30 minutes (I did an hour). Return pan to burner over medium heat. Spray with cooking spray or add additional oil for cooking the burgers. 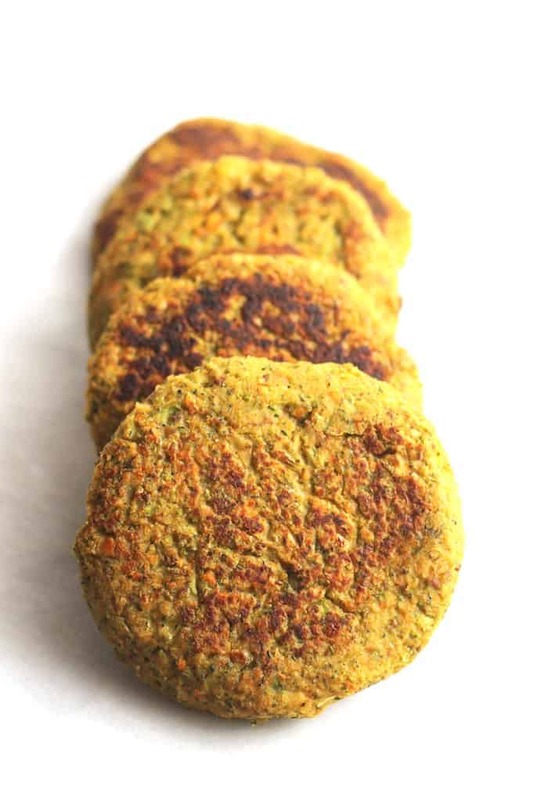 Once hot (the pan should sizzle), cook patties for about 4 minutes per side or until browned. Serve on whole grain buns or spinach with hummus or desired condiments. Slashing my tuna burgers this week for these! So glad I have some broccoli in my fridge! I don’t usually mind ingredients like NY or flax meal, but I hate when I buy something for one recipe and it just sits in my pantry/fridge because I can’t figure out what to do with it! i.e. I just bought a bag of coconut flour for a recipe, but it seems like all other recipes need like 4+ eggs. Haha, at least it won’t go bad for a while! Weeee! That is SO true with coconut flour. But you should totally make the banana bread from Civilized Caveman! I made them it into muffins and couldn’t get enough. Looooove. And even more so because of the oat flour, nutritional yeast, and ground flaxseed ;) Couldn’t live without those suckers! These look fabulousssss. I swear you are the queen of veggie burgers. Nooch is one of those ingredients that just hangs in your pantry, ya know?! Time to use that bad boy up! CHEEZE. The recipe does not mention combining the onions, broccoli, and garlic with the other ingredients? You don’t scare me, girl! I like that I now know what those thangs are and have them in my kitch. It’s fun to learn about and use new healthy things, but I second the gal above who buys something for a recipe and then it sits around. #guilty. But it’s great to have a varied diet and try new things and learn about them. Although I’m a bit worried about getting my B vitamins now haha. These look so gorgeous! Adding to my list. Yum. I have two bags of organic cornmeal sitting around…totally guilty of that as well! Oh and two bags of chickpea flour. Holy chickpea flour breakfast pizza!! Wahoo!! You even cooked your own chickpeas?! You win the award of awesomeness! Thanks, dear! Nutritional yeast is a totally freaky ingredient–I’d be surprised it it DIDN’T freak you out! I’m confused about nutritional yeast. One of my friends told me that it mimics msg or glutamate in the body, which I thought was bad… What is your expert opinion? Definitely not the case! I did some research and found that all yeasts have small amounts of free glutamic acid because when the yeast cells die, the protein from the cells walls breaks down into amino acids, including naturally occurring non-essential glutamic acid. This is in all yeast cells as well as some veggies and, meat, and fungi. This kind of glutamic acid is natural, and not in the artificially produced free form added to processed forms for flavor (think yeast extract or autolyzed yeast extract). Hope that helps! What an insightful comment!! I too dream of that one cheezey day. Your pictures are amazing dearest- I need these and the associated stomach pains- I once tried flavouring plain corn chips with nooch. Ugh I have everything to make these but I just used the last of my giant tub of nooch. Getting some more ASAP and these are on my list! Wahhhh! You must refill your giant tub immediately! Erryyyytime I read your posts I’m laughing out loud in class getting awk stares. These look so easy and tasty and I can’t wait to make a batch and freeze this weekend! Question: can I just use extra oats instead of breadcrumbs? I have zero bread currently but lotsa oats! Obvi I just text you the answer immediately…Skipping the oats are using bread crumbs is totes fine! Yummmm great flavour combo girl! Gotta love that nooch. Right?! So gosh darn CHEEZAY. Fabulous! Thanks for reporting back, Alyssa! Yuuumz I can’t wait to try these! 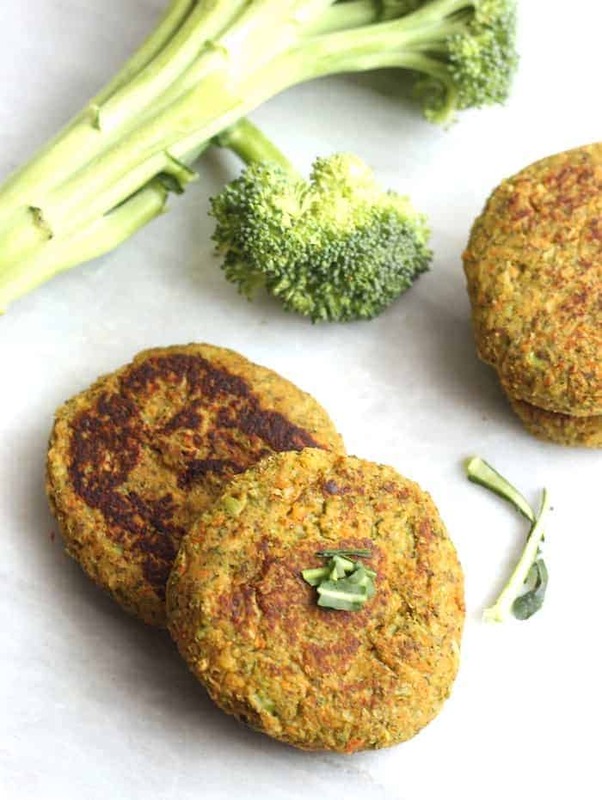 I loved your roasted broccoli and chickpea burgers – these will be even better with the delicious addition of nooch. Can’t get enough of those cheezy B12s. Personally, I love the use of different ingredients. It gives me inspiration to try new things. Nooch, flaxseed, chickpea flour, oat flour, coconut flour (pretty much any “weird” flour” lol) have all become staples in my pantry thanks to blogs like yours! Mmmm they’d probably be fab with that zesty cashew mayo on top, too! Yay for funky staples. this is the perfect remedy to a boring black bean burger. And no, those ingredients don’t freak me out! I love oat flour, nutritional yeast AND ground flax. There’s nothing worse than a boring veg burger! They have SO much potential ;) Glad you’re on the funky yet fun ingredient bandwagon! OMG. I CAN’T. LITERALLY. I JUST CAN’T. These look freakin’ amazing! And I’m so happy you too the time to educate us on nutritional yeast. I have a bag in my fridge and you just reminded me that I need to use it more often. And you know I love all of those ingredients so keep ’em comin’ missy!! Shoot, I should probs be keeping mine in the fridge too…. LOLZ. I just bought a bag of flax and hemp seeds to play around with. Would love to see a post with you breaking down what different ingredients can be used for, their benefits, and what not. Who better to explain to us than a RD right?! That post is coming you way!! Let me know if there are any specifics you’d like me to include! I always buy ground flax since you don’t absorb the nutrients unless it’s ground! Just wanted to drop by and drop you a few lines. I think too many times I am a fervent reader of some blogs but I just read, and scroll, and read some more.. but I never really leave a comment. Shame on me! My husband is diabetic and we are working hard to get his values under control.. so I am undergoing a big change from just cooking ‘whatever sounds and tastes good’ to making something healthy and tasty. I understand the ‘science’ behind diabetes and what to eat, what not to eat, etc.. but sometimes inspiration is lacking. Your blog really helps inspire me to combine certain foods and flavors together, make different things with familiar ingredients, etc. After being stuck in a rut of ‘regular’ cooking it’s a big switcharoo to cook differently and often I am uninspired or simply do not know what to do for dinner :) so THANK YOU! That being said and to answer your question.. for ‘newbies’ like myself, at times it is a little daunting to read a recipe for which I don’t have, say, 80% of the ingredients. Maybe an idea is to have a permanent pane on your blog, or even just a blog post, with recommended pantry items and the versatility of those ingredients (shoot, if you really want to get in depth common substitutions would be awesome). Sometimes I do turn away because I see an ingredient in 1 recipe, but it doesn’t show up in many others so I wonder if I should go ahead and buy it and have it sit in my pantry indefinitely. Now, I am building a more well-stocked pantry slowly but surely – and if I am unsure of something like a substitution or whether you can skip an ingredient (like chia seeds for example) I usually just Google it. No worries! Coconut flour can’t be subbed since it requires so much liquid and eggs. Almond meal sometimes works though! YES. I am obsessed with your Roasted Brocc Chickpea Burgers (they are on my dinner menu at least once a week) and you have already converted me to Nutritional Yeast (which I was super skeptical about trying because what a terrible name….but it is truly an amazing, earthy, cheesy flavored ingredient) via your Vegan Corn & Wild Rice Chowder and Creamy Pumpkin Pasta (both of which I make constantly). Nutritional Yeast is not another one of those weird ingredients that will get hidden in your cabinet only to be unearthed years later. It’s a staple…like salt, pepper….and wine. Anyway, I’m super excited to combine the burgers with the cheeze! Seems like a match made in heaven. P.S. You also converted me on flaxseeds as well…they are the business and add such a wonderful, nutty layer to recipes. Weeeee how fabulous! These are like the second cousin of those burgs. How amazing that you appreciate nooch for all its glorious noochiness :) And yay for flax! These look amazing. Do you think they would work being baked instead of cooked in a skillet? I’m always a fan of baking my veggie burgers, mostly because it allows me to not have to baby-sit them as much. Any suggestions for how to go about baking them? Baking should be fine! Maybe 20 minutes per side on like 375? That’s totally a guess, though! Which brand of nutritional yeast do you prefer? Can I substitute chia seeds for the flax? Yay! I hope you love them, lady! Nice looking recipe! Have you ever baked these instead of frying them? Just curious, because I am doing the Dr. Furhman diet, and olive oil (or any oils) are kind of a no-no. Once I am done with that, I will try them fried, but I guess I will just try them baked and see what comes out of it. But they sound delicious! Thanks for the recipe! I just use olive oil spray from Trader Joe’s so it’s pretty minimum on the oil, but I’m sure baking them would work! I haven’t tried it so let me know! No, if it’s only that much spray oil, I will do it that way! It sounds so good–I showed the recipe to my daughter and she’s excited for me to make them, too! Thanks! these came out great!! I’m on a mission to try new things and this was my first time using nutritional yeast. I smeared them with a coat of hummus and they were delicious! Mmmm what isn’t better smeared with a coat of hummus?! Hi, quick question. Do you make a flax ‘egg’ or just add the flax meal to the other ingredients without the previous step? Thanks! Hi! Just found this recipe and i’ll try to do it. In my country we use grams and about the part “½ cup + 1 tbsp oat flour” so is ½ cup of oat flour and add another tablespoon? or is it a tablespoon of water? This burger was soooo delicious. Found this recipe via Pinterest. Next time I will half the amount of salt though as is was a bit too salty for me. First experience with Nutritional yeast and ground flax seed in place of eggs… Turned out great, was able to shape into patties with no problem. Thanks for the recipe!! I made these in small slider size. I didn’t alter the recipe, and they are wonderful. My daughter loved them and my picky 12 y.o. son liked them too!! The recipe made about 2 dozen slider size patties. I’m hoping they freeze well so I can make a quick weeknight meal. These will definitely be in my rotation of meals. Thanks for a great recipe!! something, then uses other have on another day. Wish i lived or had reason to visit Columbus, would love to stop by Alchemy. Mmmm how fun to make them like chips with dip!! Love it. I can’t wait to look more into what your site has. I appreciate this info for sure! !